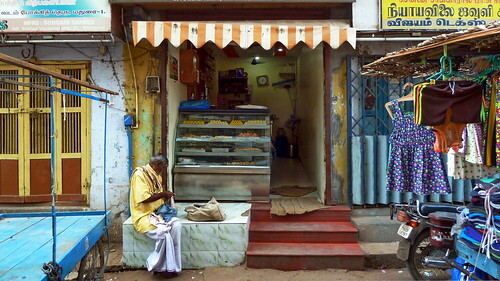 Madurai is a major city in the state of Tamil Nadu in southern India. It is the administrative headquarters of Madurai District. Madurai is the third largest corporation city by area and third largest city by population in Tamil Nadu. and the 31st largest urban agglomeration in India. Located on the banks of River Vaigai, Madurai has been a major settlement for two millennia and is one of the oldest continuously inhabited cities in the world. Madurai is closely associated with the Tamil language, as all three primary congregations of Tamil scholars, the Third Tamil Sangams, were held in the city between 1780 BCE and the 3rd century CE. The recorded history of the city goes back to the 3rd century BCE, being mentioned by Megasthenes, the Greek ambassador to India, and Kautilya, a minister of the Mauryan emperor Chandragupta Maurya. The city is believed to be of significant antiquity and has been ruled, at different times, by the Pandyas, Cholas, Madurai Sultanate, Vijayanagar Empire, Madurai Nayaks, Carnatic kingdom, and the British. Madurai has important government educational institutes like the Madurai Medical College, Homeopathic Medical College, Madurai Law College, Agricultural College and Research Institute. Madurai city is administered by a municipal corporation established in 1971 as per the Municipal Corporation Act. Madurai is the second corporation in Tamil Nadu next to Chennai corporation. The city covers an area of 147.99 km2 and had a population of 1,017,865 in 2011. The city is also the seat of a bench of the Madras High Court, one of only a few courts outside the state capitals of India. The city is referred by various names like "Madurai", "Koodal", "Malligai Maanagar", "Naanmadakoodal" and "Thirualavai". The word Madurai is derived from Madhura (sweetness) arising out of the divine nectar showered on the city by the Hindu god Shiva from his matted hair. Another theory is that Madurai is the derivative of the word Marutham, which refers to the type of landscape of the Sangam age. There is a town in the neighbouring Dindigul district called Vada Madurai (North Madurai) and another in Sivagangai district called Manamadurai. The different names by which the city has been referred to historically are listed in the 7th-century poem Thiruvilayaadal puraanam written by Paranjothi Munivar. Koodal means an assembly or congregation of scholarly people, referring to the three Tamil Sangams held at Madurai. Naanmadakoodal, meaning the junction of four towers, refers to the four major temples for which Madurai was known for. Tevaram, the 7th– or 8th-century Tamil compositions on Shiva by the three prominent Nayanars (Saivites), namely Appar, Sundarar and Thirugnanasambandar, address the city as Thirualavai. As per Iravatham Mahadevan, a 2nd-century BCE Tamil-Brahmi inscription refers to the city as matiray, an Old Tamil word meaning a "walled city" derived from an older Dravidian source. Madurai has been inhabited since at least the 3rd century BCE. Megasthenes may have visited Madurai during the 3rd century BCE, with the city referred as "Methora" in his accounts. The view is contested by some scholars who believe "Methora" refers to the north Indian city of Mathura, as it was a large and established city in the Mauryan Empire. The city is also mentioned in Kautilya's (370–283 BCE) Arthashastra. Sangam literature like Maturaikkāñci records the importance of Madurai as a capital city of the Pandyan dynasty. Madurai is mentioned in the works of Roman historians Pliny the Younger (61 – c. 112 CE), Ptolemy (c. 90 – c. CE 168), those of the Greek geographer Strabo(64/63 BCE – c. 24 CE), and also in Periplus of the Erythraean Sea.After the Sangam age, most of present-day Tamil Nadu, including Madurai, came under the rule of the Kalabhra dynasty, which was ousted by the Pandyas around 590 CE. The Pandyas were outsted from Madurai by the Chola dynasty during the early 9th century. The city remained under the control of the Cholas until the early 13th century, when the second Pandyan empire was established with Madurai as its capital. After the death of Kulasekara Pandian (1268–1308 CE), Madurai came under the rule of the Delhi Sultanate. The Madurai Sultanate then seceded from Delhi and functioned as an independent kingdom until its gradual annexation by the Vijayanagar Empire in 1378 CE. Madurai became independent from Vijayanagar in 1559 CE under the Nayaks. Nayak rule ended in 1736 CE and Madurai was repeatedly captured several times by Chanda Sahib (1740 – 1754 CE), Arcot Nawab and Muhammed Yusuf Khan (1725 – 1764 CE) in the middle of 18th century. In 1801, Madurai came under the direct control of the British East India Company and was annexed to the Madras Presidency. The British government made donations to the Meenakshi temple and participated in the Hindu festivals during the early part of their rule. The city evolved as a political and industrial complex through the 19th and 20th centuries to become a district headquarters of a larger Madurai district. In 1837, the fortifications around the temple were demolished by the British. The moat was drained and the debris was used to construct new streets – Veli, Marat and Perumaal Mesthiri streets. The city was constituted as a municipality in 1866 CE. The British government faced initial hiccups during the earlier period of the establishment of municipality in land ceiling and tax collection in Madurai and Dindigul districts under the direct administration of the officers of the government. The city, along with the district, was resurveyed between 1880 and 1885 CE and subsequently, five municipalities were constituted in the two districts and six taluk boards were set up for local administration. Police stations were established in Madurai city, housing the headquarters of the District Superintendent. It was in Madurai, in 1921, that Mahatma Gandhi, pre-eminent leader of Indian nationalism in British-ruled India, first adopted the loin cloth as his mode of dress after seeing agricultural labourers wearing it. Leaders of the independence movement in Madurai included N.M.R. Subbaraman and Mohammad Ismail Sahib. The Temple Entry Authorization and Indemnity Act passed by the government of Madras Presidency under C. Rajagopalachari in 1939 removed restrictions prohibiting Shanars and Dalits from entering Hindu temples. The temple entry movement was first led in Madurai Meenakshi temple by independence activist A. Vaidyanatha Iyer in 1939. Madurai is built around the Meenakshi Amman Temple, which acted as the geographic and ritual center of the ancient city of Madurai. The city is divided into a number of concentric quadrangular streets around the temple. Vishwanatha Nayak (1159–64 CE), the first Madurai Nayak king, redesigned the city in accordance with the principles laid out by Shilpa Shastras (Sanskrit: śilpa śāstra, also anglicised as silpa sastra meaning rules of architecture) related to urban planning. These squares retain their traditional names of Aadi, Chittirai, Avani-moola and Masi streets, corresponding to the Tamil month names and also to the festivals associated. The temple prakarams (outer precincts of a temple) and streets accommodate an elobrate festival calendar in which dramatic processions circumambulate the shrines at varying distances from the centre. The temple chariots used in processions are progressively larger in size based on the size of the concentric streets. Ancient Tamil classics record the temple as the center of the city and the surrounding streets appearing liken a lotus and its petals. The city's axes were aligned with the four quarters of the compass, and the four gateways of the temple provided access to it. The wealthy and higher echelons of the society were placed in streets close to the temple, while the poorest were placed in the fringe streets. With the advent of British rule during the 19th century, Madurai became the headquarters of a large colonial political complex and an industrial town; with urbanisation, the social hierarchical classes became unified.